''The High Ground'' shows a little of Outram''s countryside silhouetted against a lot of sky, the fading shades of a dramatic sunset. There is only the ''gloaming'' light left to illuminate the small figure of a man, a dog and some scattered birds on the horizon. 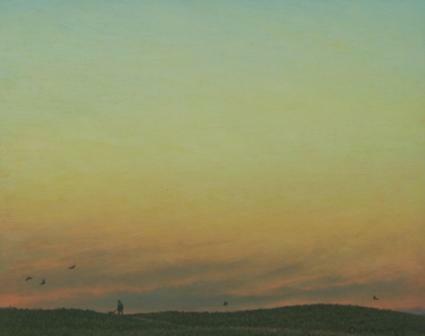 We get a sense of Steven Outram''s respect for the beauty and power of nature in this contemporary oil painting.